Twelve year old Sinusia has a good reason to smile: she will have a lot less walking now that the bridge, built with Fair Trade money, is ready. Sinusia lives with her parents and about one hundred other families in the isolated Govinna-section of the plantation. To get just about anywhere was either a very long walk or an expensive ride with a motorcycle taxi. But what everyone dreaded most were medical emergencies. An ambulance would have to come on an eleven kilometre long route. With the new bridge the hospital is just three kilometres away, which means getting help is not nly a lot quicker, it also is cheaper - less than a third of the price that had to be paid for the old, long route. And a nearby village benefits too. Twice a year their access to the main road gets flooded, isolating as many as 4000 people. Now they can use the new bridge during the monsoon rains. Generations of workers have been asking for a bridge to be built, the plan was suggested more than 60 years ago. A good start for the Fair Rubber Association: The bridge is the first Fair Trade project since it was founded in 2012. 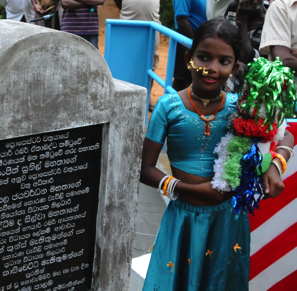 Small wonder, the plantation workers decided to celebrate the opening and erect a stone to commemorate the event. It’s been a very long wait for a short journey. Lalita Ayrangani’s day starts early. She gets up at 4.30 and starts cooking for the whole family, rice, curries and sambols for breakfast and lunch to be taken along to work. Her son and his wife, her daughter and her four-year old grandchild live next door. At 6 am 44-year old Lalita walks to the rubber factory, work starts at 6.30. Until recently she had to get up even earlier: more than a year ago the tank that fed the water pipes at Lalita’s house collapsed which meant she and everyone else in the family had to walk to a water source about half a kilometre away several times a day to get all the water needed for cooking and drinking. The joint body agreed that the restoration of the water tank was a priority and since the work has been completed the faucet behind Lalita’s house supplies water again and when she’s filled up one of the wide-bellied stainless steel vessels she’s just got to step around the corner into her kitchen. Lalita returns from work at around 3.30 pm. Usually she shops for some groceries in the estate’s coop shop and for vegetables at nearby stalls. When she comes home she plays with her granddaughter, washes the family’s clothes, has a bath and prepares the evening meal. Lalita’s children all work in the garment companies. Transport is provided, but the income is low, just Rs 12,000 per month. Why are they not working on the plantation where they could earn more? Lalita smiles and shrugs – the work in the garment factory is clean, she says, and the children are educated, they think plantation work is not for them. ‘Many young people work for a few years in the garment industry’ says Horana manager Nisala Jayawardena, ‘but once they reach 30 they have enough of long commutes and noisy factory halls and they apply for jobs on the plantation'. Lalita came to Horana with her parents and grandparents when she was 7 years old, her father still works in the factory, her mother is retired. Since the death of her husband she has two rooms to herself. Her living room with its lovingly arranged display of family photos and small knickknacks leads out onto a small veranda. The other family members share the rest of the house, two bedrooms and a living room with an array of artificial flowers and a small television set in the corner. The children come home at 7.30 and the living room is where everyone gets together for the evening, just in time for the Sinhala soap operas on TV. What are Lalita’s hopes for the future? Now that the water is running again she is content, she says. She just wants her children to do well and settle down somewhere nearby in their own homes.